Everything we do is Deliberate. For instance we are asked “why don’t you have a drive thru?”. While it removes having to get out of your car, it also removes the experience we are committed to. Why do we only give a chocolate when ordered in a house mug and not a to-go cup? Because we reward customers for taking a moment to slow down and be a part of the experience. Most small businesses neglect the small details. REDBAR considers every detail part of the overall experience. Next time you are in, take a look at the pictures on the walls. You’ll see a common theme of our trademark RED streak running through cities with a rich coffee culture around the world. But you’ll also find a REDBAR ceramic demitasse cup somewhere in each of the pictures. But when it comes to Deliberate, it doesn’t get more important than in the sourcing of our product. We purchase our coffee beans from one of the top roasters in the world, Klatch Roasters in California and ship them freshly roasted to our stores. Klatch Roasters holds some of the highest accolades in the coffee world from the Golden Bean Award, World’s Best Espresso, and regular rankings on Coffee Review in the high 90s. 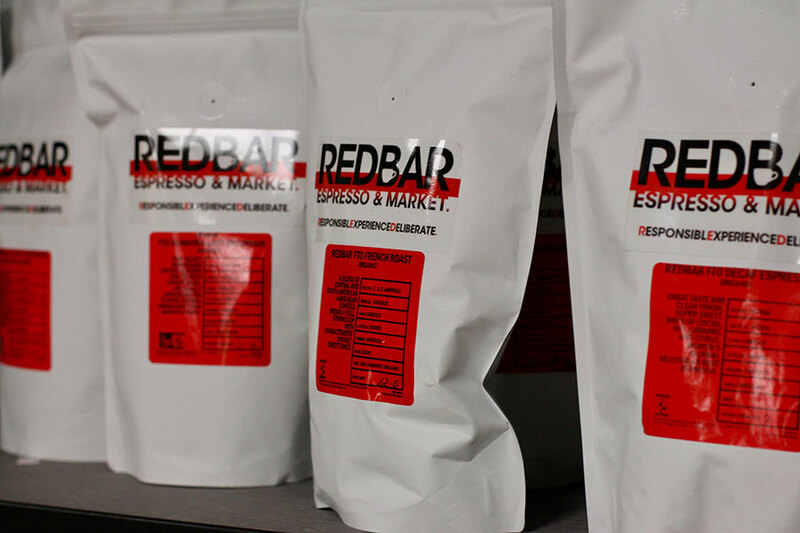 Each bag is label dated with the date roasted and cycled through appropriately so you never drink a cup out of freshness. We only purchase their organic varieties to ensure no pesticides or undesirables are consumed. There are only a handful of places in the country where you can enjoy this level of expertly roasted quality coffee sourced from sustainable farms around the world at purchase prices that support the farmers, their families, and their communities. Coffee is of course only half a latte. Where most chains and stores purchase milk for the lowest price, that means you are drinking homogenized, super pasteurized milk pumped full of antibiotics and growth hormones from unhealthy cows often milked to the point of developing mastitis (utter ulcers). You are what you consume, so best practice is to be considerate in what you consume regularly. We source our milk from local farmers, focusing on farms who follow organic standards, don’t use antibiotics or growth hormones, and are grazed on grass fields not troughs of corn and grains. As our coffee and milk are the two most important products used in a coffee shop, these are two details we take very seriously. Deliberate honesty is important.